It’s Friday people, yes – that glorious day of the week where there’s nothing but two days of total freedom ahead! Now, turning full time blogger has done nothing to dampen my enthusiasm for Fridays – they’re one of my favourite days of the week (also a fan of Thursdays and Saturdays). But knowing that along with the weekend ahead, there’s also a bit chance that there was a long week behind – and that can lead to a bit of an exhausted feeling. So I wanted to share two little skincare gems that I’ve been loving for a quick post-work skin care refresh. A long day/week spent in front of a computer screen, throw in some drizzle and cold and a commute, maybe the odd late night or early morning…and at the end of the day or week your skin might be showing the effects, feeling a bit ‘meh’ and in need to a bit of a boost. One of the easiest and quickest ways to give your skin a boost is with a decent pop of hydration – and I’ve been turning to this Murad Pore and Line Minimising Hydrator *. Now, I don’t really know about the whole pore minimising thing. But this is definitely a great hydrator – it’s a very light gel texture, and a little goes a long way. A pea-sized amount is enough to give my face and overall coating and boost. It absorbs quickly and feels wonderfully refreshing to use, so it’s nice to have this (post cleanse) at the end of the day. It can of course be combined with another moisturiser, but personally I lie this as my ‘evening’ hydration boost- not a day cream as no SPF, but not as heavy as a night cream. 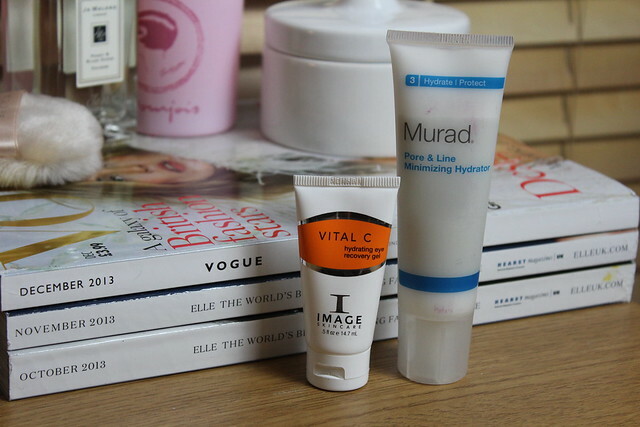 Then, to give the eyes a post computer-screen-dazed boost I’ve been absolutely loving this Image Vital C Hydrating Gel * – it’s a light gel, packed with Vitamin C and manages to really give the eye area an instant refresh and hydration boost. It’s not too thick and doesn’t leave any residue, but it is really cooling and refreshing to use. It’s not *the* most hydrating thing I’ve used, but the refreshing element works a charm with this one. So if you tend to get home and feel a bit cross-eyed from a day in front of a screen, before you sit in front of a new set of screens (laptop/TV/phone…all of the above) give your eyes a bit of a treat with something like this. Just to cool, hydrate and refresh. Oh, and if you’re feeling a bit hungover – use this, it’s perfect for ‘morning after’ eyes. What do you do for a post-work pick me up?